When you have a week of snow days – we went to school on Thursday only last week and that was only for 5 hours – you have plenty of time to make your own art. I managed to finish this series of prints of jellyfish. I ordered some new ink before the snow days, thankfully, and two of the colors I picked out glow in the dark. I decided jellyfish would be an appropriate experiment and theme for this new ink. This was a tricky and time-consuming print with two plates and a background rolled with blues and silver ink. I am happy with the end result and will be donating this particular print to a silent auction in March. 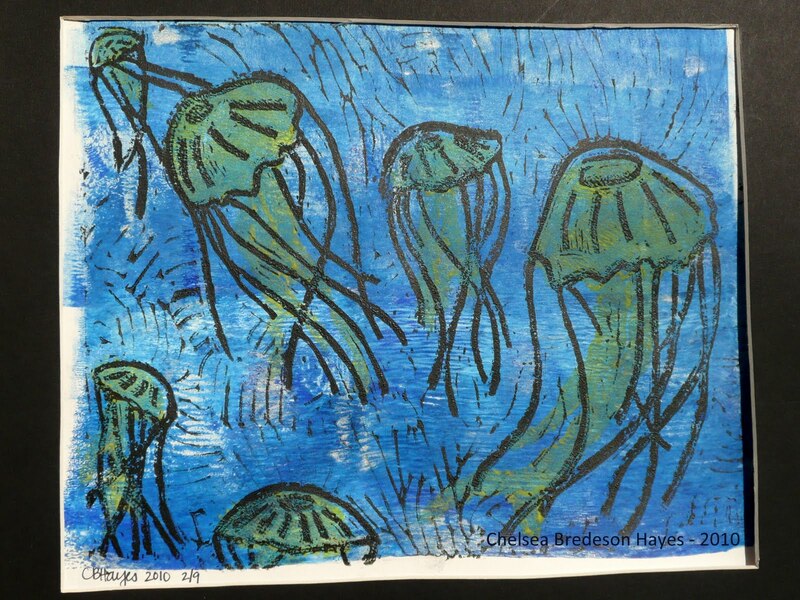 Jellyfish, block print, 8×10″, 2010.